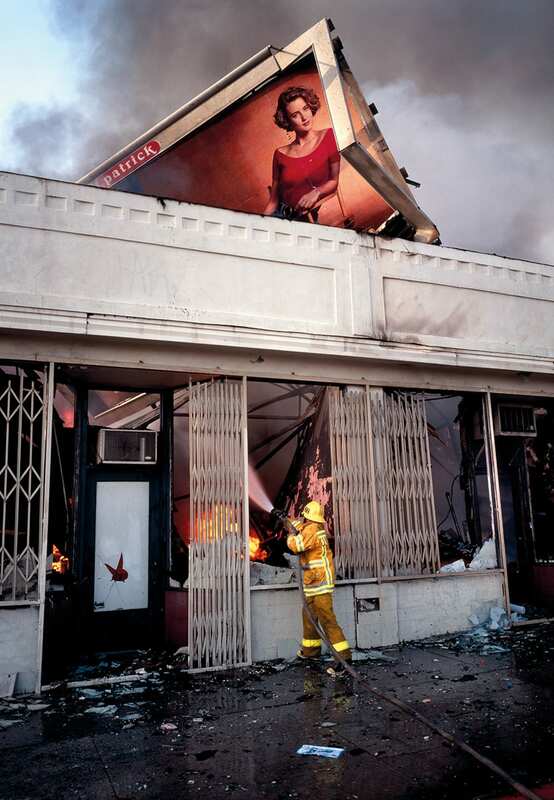 Allan Sekula, Koreatown, Los Angeles. April 1992. Courtesy of the Allan Sekula Studio. Our story begins tonight not with an image of the sea but of a burning building in Koreatown, Los Angeles. 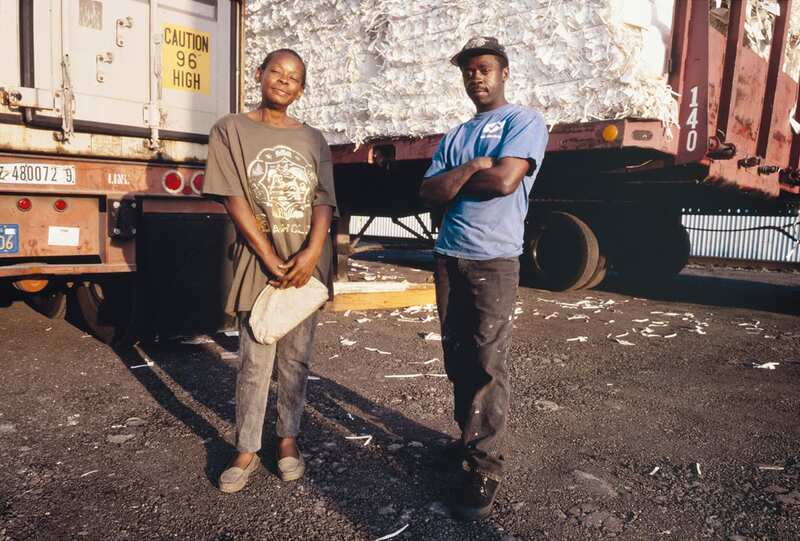 The photograph is found half-way through the first chapter of Sekula’s Fish Story. It is late April 1992, the same month and year when Los Angeles burned for five straight days after the not-guilty verdict in the Rodney King Trial. In the photograph, smoke bleeds across the skyline while a fireman, turned away from the camera’s lens, reaches past a broken threshold to direct his hose toward the collapsed structure. Obliquely tilted, the billboard that punctuates the top half of the image sinks through the roof of the building, almost resembling a half-sunken bow of a ship. The female protagonist of the photograph, not yet touched by the riot’s flame but burnished by a golden halo, looks out toward the viewer and calmly surrenders to the wreckage. This particular photograph is the fourteenth image in the book’s sequence. The image is placed before a double page spread of two blurry, nighttime photographs shot in May 1990 of shipyard-workers’ housing, uprooted, repurposed and later moved — just like shipping containers — from the neighborhood of San Pedro to South Central Los Angeles; and a rather uneventful daytime photograph of immigrant-workers in Los Angeles harbor cleaning up a chemical spill, October 1992. Allan Sekula, Shipyard-workers’ housing—built during the Second World War—being moved from San Pedro to South-Central Los Angeles. May 1990. Courtesy of the Allan Sekula Studio. In this opening chapter, the camera’s movements are expansive and disorienting, shuttling from the Staten Island Ferry in New York to an ancient port in Rome to an automated harbor in Rotterdam, and yet, all the while, the camera doubles back to the photographer’s native Los Angeles. For it is LA and Southern California upon which the first sequence pivots. As the project jumps backwards and forwards in time, and geographically, from one city to the next, the sequence returns again and again to Los Angeles. When Sekula explores the abandoned shipyard at Terminal Island (LA) his camera is intent on detailing the port’s many afterlives and guises: Terminal Island reincarnated as a movie set; elsewhere, its buildings reconstructed as a mock village for the US Marines to practice ‘counter-terrorist’ exercises; and finally, the site reclaimed as an improvised scrapyard, where the unemployed shipyard sandblaster, a woman named ‘Pancake,’ is photographed scavenging for copper. Allan Sekula, “Pancake,” a former shipyard sandblaster, scavenging form a waterfront scrapyard. Los Angeles harbor. Terminal Island, California. November 1992. Courtesy of the Allan Sekula Studio. As the sequence unfolds, we come to realize that the many different workers who make a living by and through the sea — deckhands, cooks, sailors, welders and the like — are not just seasonally employed, but more often than not, unemployed. If one could say that Sekula adopts the traditional stance of photographic reportage, he approaches the stance obliquely in order to unlock a different trajectory to the genre. For instance, the specificity of a day’s events — such as a riot, a chemical spill, or a re-christening of the Exxon Valdez oil tanker in San Diego Harbor as the Exxon Mediterranean — are suggestively paired with the dirty minutiae of photographic observation. In two photographs taken in the bankrupt Todd Shipyard two years after its closing, the camera pauses on a vacant Welder’s booth. 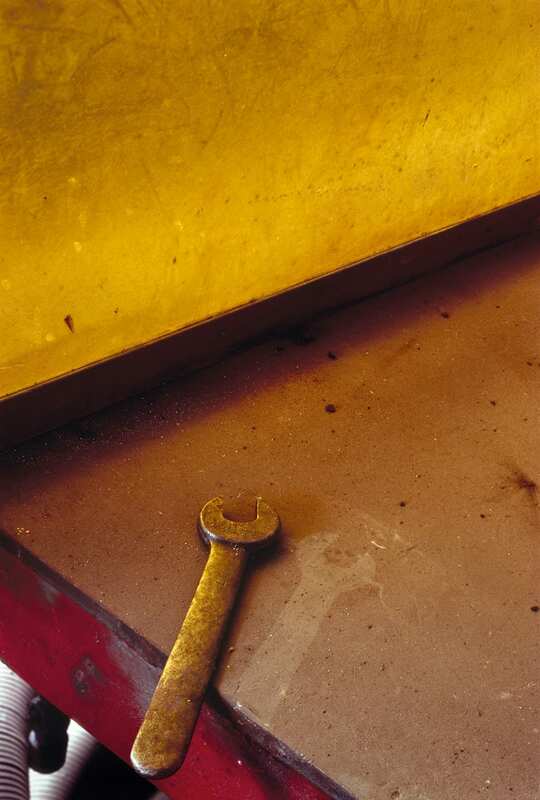 Sekula picks up a wrench, one can presume, and moves it ever so slightly to reveal the passage of time — a glowing afterimage of dust, grime and rust. Allan Sekula, Welder’s booth in the bankrupt Todd Shipyard. Two years after closing, Los Angeles harbor. San Pedro, California. July 1991. Courtesy of the Allan Sekula Studio. Since its publication in 1995, Fish Story has been subject to extensive analysis and critique — analyzed for its capacity to articulate larger histories of globalization, uneven development and neoliberal capital — but more often than not the photographs have eluded sustained description and analysis. Although it might be tempting to rehash these arguments over the work’s larger meaning and context, it feels necessary when reconsidering the work today to re-enter the work and think through the book’s sequencing, rhythms, and logic. This line of inquiry can begin by staging a simple question: What demands do these photographs make on the viewer? In a sense, this model of photography is one dedicated to a dislocating mode of presentation — an account that takes into consideration the unexpected jumps and countermovements found within the photographic sequence (Rome to Rotterdam, for instance) — but also, the camera is dedicated to the slow unfolding of a particular site through photographic description (Terminal Island). 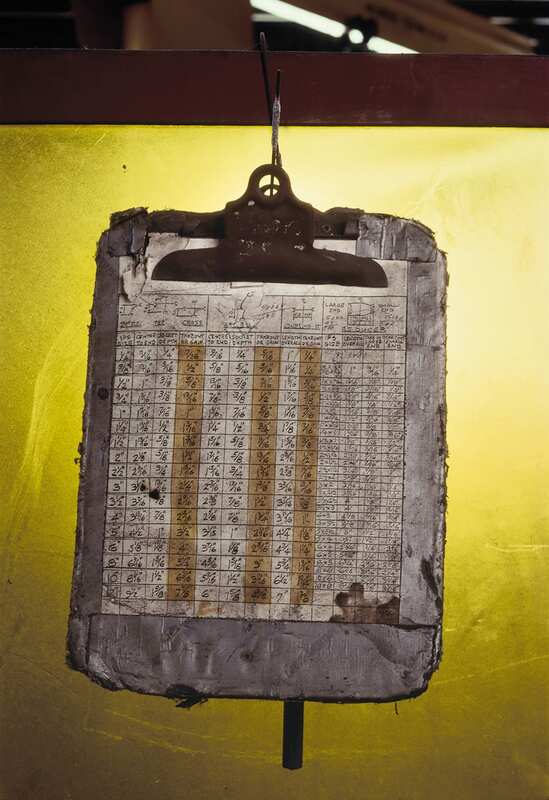 In this mode, the work should be read in its messy specificity — something like an obdurate physical impression or trace — similar to Sekula’s photograph of dust, grime and unemployment, considered here as a moment of historical delay and latency. 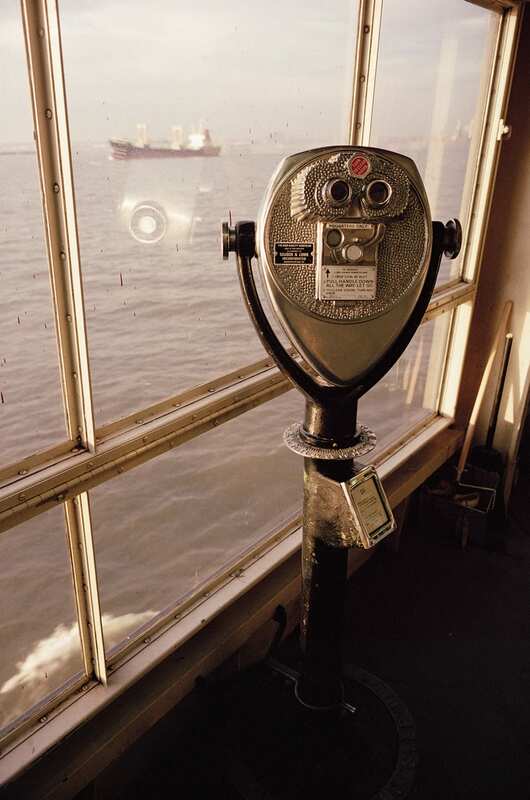 The oscillations of Sekula’s camera — wandering but direct, curious but critical — is elaborated, suggestively, in the very first pair of images from Fish Story where Sekula photographs a young boy on the Staten Island ferry, shown grasping at a set of stationary binoculars, looking off-camera (we are told) toward his mother. One could presume, perhaps, that this young boy is asking his mother for some spare change to unlock the binoculars, so that he is able to cast his eyes upon the expansive panorama, possibly the blurry ship set off in the distance or some sealife as it floats by on the horizon. Allan Sekula, Staten Island Ferry. New York harbor. February 1990. Courtesy of the Allan Sekula Studio. 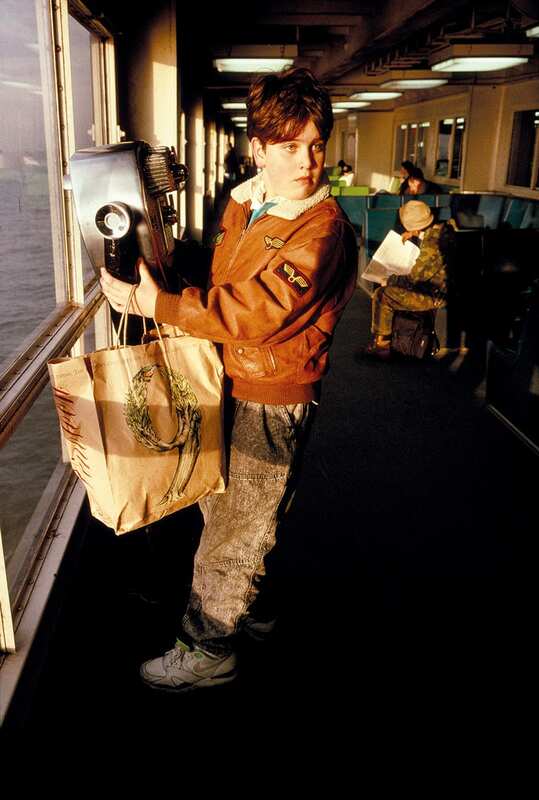 Allan Sekula, Boy looking at his mother, Staten Island Ferry. New York harbor. February 1990. Courtesy of the Allan Sekula Studio. Allan Sekula, Abandoned shipyard used by Marine Corps Expeditionary Force for “counter-terrorist” exercises. Los Angeles harbor. Terminal Island, California. November 1992. Courtesy of the Allan Sekula Studio. 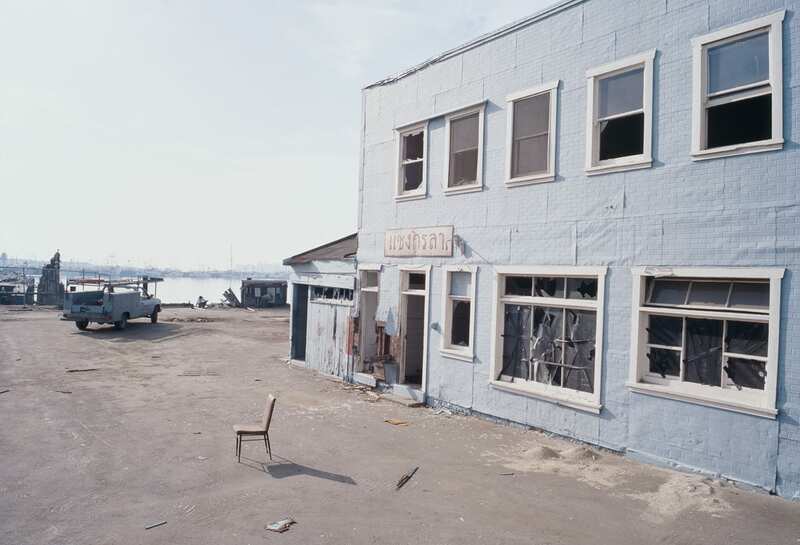 When viewed through this lens of ruin, recovery and revival, Sekula’s crude materialism, then, could also be said to have adopted the diverse language of the port — a language, no doubt, heard from-below: encountered in the unemployment offices of Gdańsk, in the fish markets of Puerto Pesquero, throughout the outskirts of Los Angeles, within the engine rooms of tuna fishing boats, and around the Longshore workers charcoal grill. The task of the historical materialist is to provide expression to that which has been obscured or evicted from experience, rather than bask in the power and glory of official history. 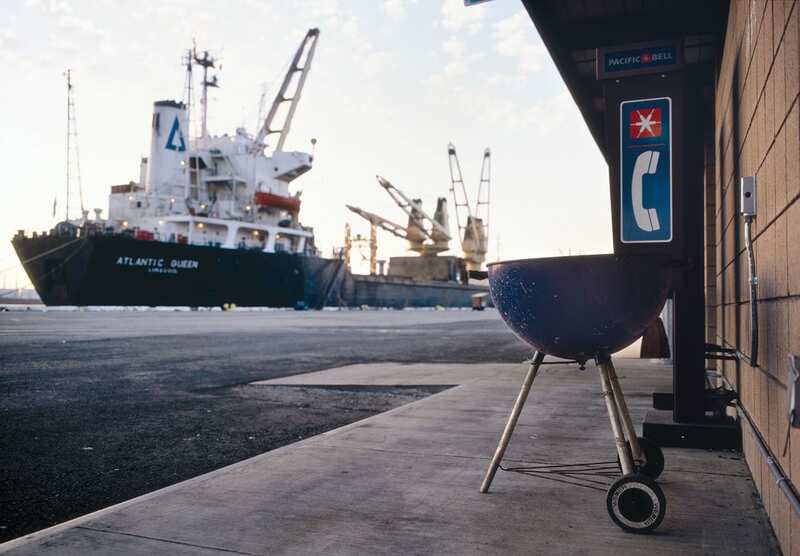 Allan Sekula, Longshore workers’ charcoal grill and the Atlantic Queen. Los Angeles harbor. Wilmington, California. July 1994. Courtesy of the Allan Sekula Studio. Two years after exhibiting Fish Story in Rotterdam in December 1995, the artist presented a paper at the Getty Research Institute titled, ‘Los Angeles: Graveyard of Documentary.’ At no time did the artist address Fish Story explicitly, but the talk did detail how Los Angeles, as a city, defied the documentary genre. 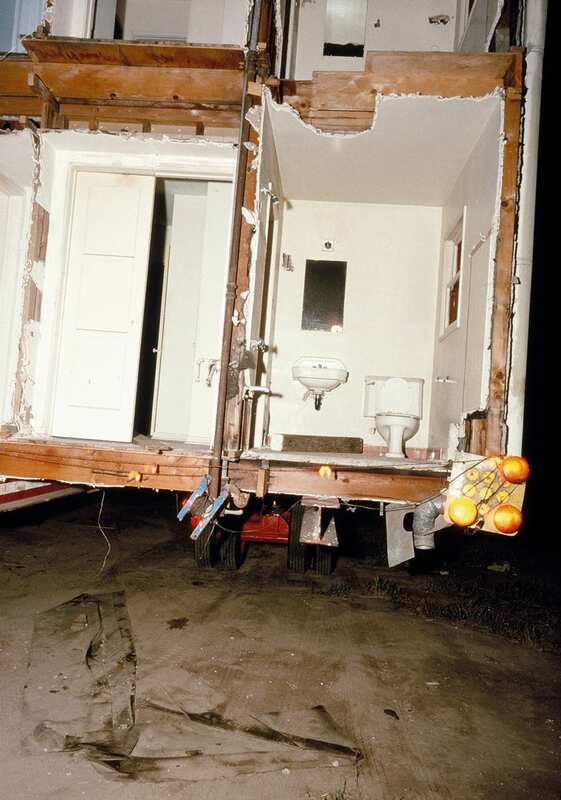 In his paper, Sekula outlined thirteen theses through which social documentary seemed ‘impossible’ in Los Angeles. ‘Urban form,’ reads one theses, ‘resits all traditional forms of social description. Physiognomy is impossible from the automobile. Distance frustrates social comparison.’3 Sprawling and superficial, the city appears indifferent to the the violence of history and the immediacy of social struggle. To make his argument, Sekula deployed Umberto Eco’s semiotic understanding of the distinctions between a genre’s ‘overcoding’ and ‘undercoding’ — a distinction between a work that has operated along existing codes (overcoding) and those works that move within non-existent codes to potential codes (undercoding).4 For Sekula, previous interpretations have historically overcoded the genre of documentary for particular urban sites: working-class housing and sidewalks of New York, the steel mill towns of Monongahela valley, and for the sharecroppers, tenant farmers and migratory agricultural workers of the 1930s Dust Bowl. Meanwhile, the city of Los Angeles appears ‘undercoded’ within the genre unable to account for the condition of unemployed aerospace engineers, for instance, pictured in the artist’s own Aerospace Folktales (1972), a pseudo-autobiographical work about his unemployed aerospace engineer father. 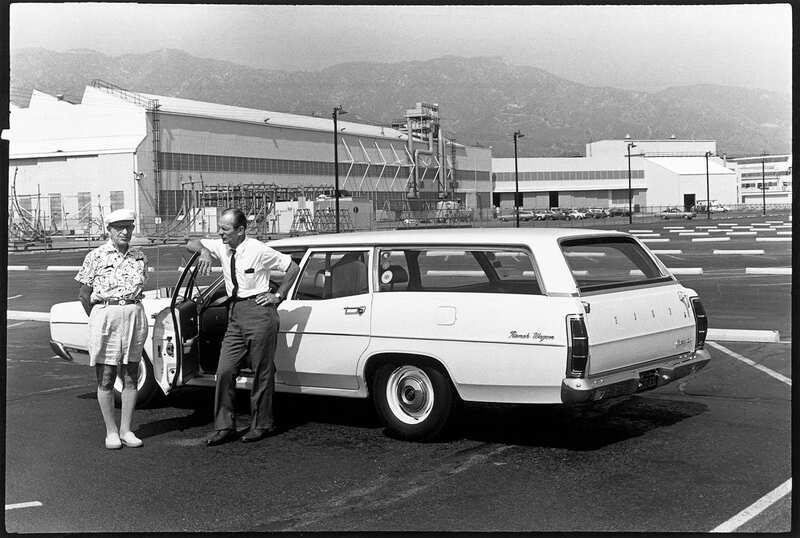 Allan Sekula, Aerospace Folktales, 1973. Courtesy of the Allan Sekula Studio. In many ways, Sekula’s argument was drawing upon one of the old tenets of the social history of art — a way of working methodologically that is concerned with the constraints or blind spots of artistic work and its relation to its public, as much as what permits work (or one’s vision) in the first place. In this tradition, of course, Sekula’s remarks are meant to be read as rhetorical: social documentary is not impossible per se, but the genre is imagined as constrained by a series of limits — wherein each limit is imagined as a barrier — a barrier that has been historically and periodically, superseded and overcome. This line of argument has been continued, in different contexts, by theorist Jorge Ribalta, who has claimed that the critical documentary practices of the 1930s remained largely illegible and suppressed during the Cold War, a phenomenon that is related to how oppositional political formations, such as communism and socialism, were repressed in the latter half of the twentieth century.8 In a sense, it would be somewhat peculiar for Sekula to suggest that social documentary was impossible, or dead, just after completing Fish Story, a work that dealt extensively with Los Angeles through the lens of documentary. For Sekula, writing in the late 1990s, the persistence of documentary in Southern California, occurred only ‘marginally and cryptically,’ as a dead genre, elsewhere understood, in his words, as a type of ‘zombie realism.’ The zombie form, in this instance, was a documentary mode, to quote Sekula, ‘where the living speak only through the dead, or through those states of being that fall between life and death.’ 9 His examples are few and far between: Henri Cartier-Bresson’s photographs of the unemployed in Pershing Square (1947), Ruscha’s Real Estate Opportunities (1970), and Maya Deren’s experimental films. For Sekula, these three figures — Cartier-Bresson, Ruscha and Deren — represent three distinctive documentary ‘undercoders’ of Los Angeles that activate or play with the particular afterlives of the image. ‘A peculiar fact about termite-tapeworm-fungus-moss art,’ to quote Farber, ‘is that it goes always forward eating its own boundaries, and, likely as not, leaves nothing in its path other than the signs of eager, industrious, unkempt activity.’10 Farber characterizes ‘termite art’ as that art that possesses buglike immersion in its material, without any particular aim, which actualizes any area of practice without celebrating it.11 This ‘bug-like immersion’ is what characterizes the detail work of Sekula’s project, but in contrast to Farber’s program, a project like Fish Story still possesses distinctive aims. 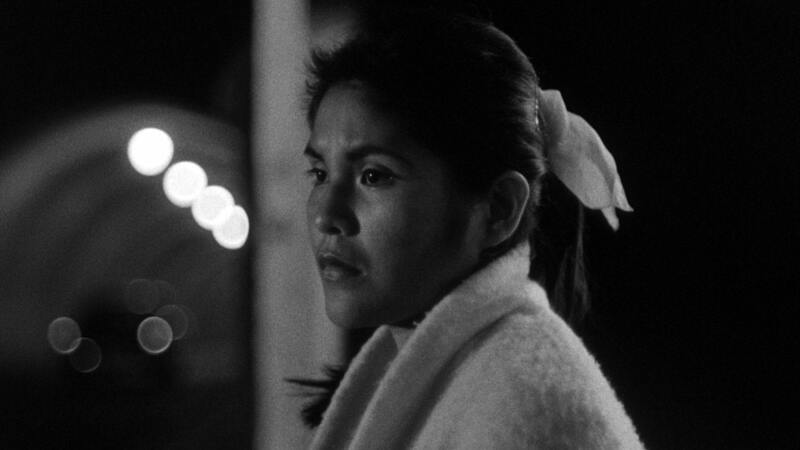 Kent MacKenzie, still from The Exiles, (1961). Reconsidering Fish Story today, the camera’s recurrent focus on Los Angeles and Southern California we can see the ways in which crude materialism and the particular stakes of Sekula’s documentary work meet — for it is Los Angeles where the artist first began to work through the problems and contradictions of planning and realizing a work of such scale, scope and magnitude, but it should be stressed, too, that it is also where Fish Story culminates. Allan Sekula, Man sleeping under a eucalyptus tree. Embarcadero Park. San Diego harbor. July 1994. Courtesy of the Allan Sekula Studio. In the final chapter of the book, Sekula’s camera lingers, from a respectful distance, on a figure of exhaustion and depletion: a man sleeping under a eucalyptus tree in Embarcadero Park, San Diego. The sequence then travels to Fontana, a suburb of Southern California, to witness the dismantling of the once impressive Kaiser steel mill. Along the way, his camera encounters Mike and Mary, the unemployed couple, who make a living by scavenging for scrap metal and who, occasionally, seek shelter in empty shipping containers. Lastly, the book ends in San Diego Harbor with a photograph of boat seized by the US Coast Guard used to smuggle undocumented immigrants from the southern provinces of China to the United States (July 1994). Allan Sekula, The guided-missile destroyer Chandler and an impounded ship used in unsuccessful attempt to smuggle undocumented immigrants from the southern provinces of China to the United States. 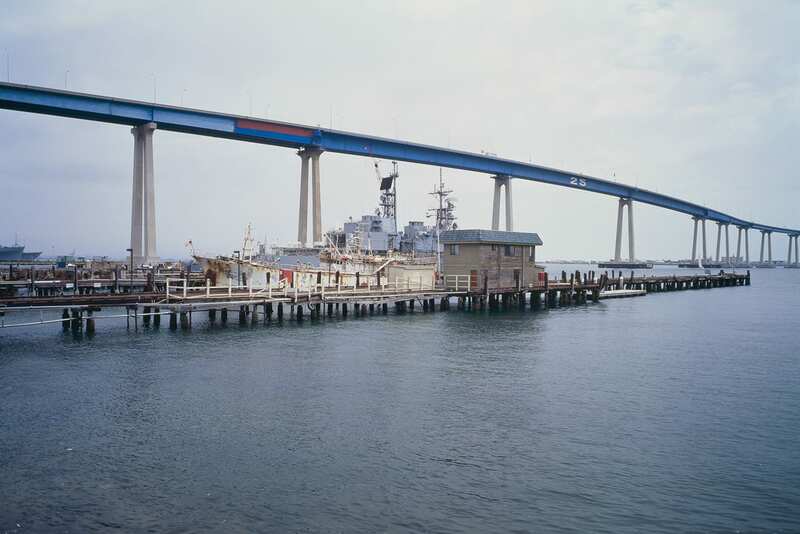 San Diego harbor. July 1994. Courtesy of the Allan Sekula Studio. Allan Sekula, Mike and Mary, an unemployed couple who survive by scavenging and who, from time to time, seek shelter in empty containers. South-Central Los Angeles. August 1994. Courtesy of the Allan Sekula Studio. The photographer works through these tensions throughout Fish Story balancing the nightmarish currents of global capital — the unrelenting race to the bottom through dispossession, destitution, eviction and exploitation — countered with fleeting glimpses of images of ‘genuine freedom,’ principally figured as the dream of a life not controlled or regimented by work. These are the peculiar rhythms of Fish Story, a work that weaves together a complex knot of times and relations, places and figures — a mode of photography and mode of seeing that is attracted as much to the discarded wrench laden with dust, as with a burning building consumed by a riotous flame, but not to forget either, the warm shadows of trees where dreams lie in wait. Talk presented for the symposium ‘Approaching the Sea: Allan Sekula’s Fish Story,’ Institute of Advanced Studies, University College London (October 24, 2018). Organized by Dr. Stephanie Schwartz. The author would like to thank Larne Abse Gogarty, Nathan Crompton, Marta Burnay and Stephanie Schwartz for reading an early draft of this essay. 1 Allan Sekula, Fish Story (Rotterdam: Witte de With; Düsseldorf: Richert Verlag, 1995), 12. 3 Sekula, “Los Angeles: The Graveyard of Documentary,” in Facing the Music: Documenting Walt Disney Concert Hall and the Redevelopment of Downtown Los Angeles (Los Angeles: East of Borneo Books, 2015), 175. 8 Jorge Ribalta, The Worker Photography Movement, 1926-1939: Essays and Documents. Madrid: Museu Centro de Arte Reina Sofia, 2011. 9 Sekula, ‘Los Angeles: Graveyard of Documentary,’ 180. 10 Manny Farber, “White Elephant Art vs. Termite Art,” (Winter 1962), Farber on Film: The Complete Film Writings of Manny Farber, (New York: Library of America, 2009), 535. 12 Jasmine Alinder, Moving Images: Photography and the Japanese Americans Incarceration, (Urbana and Chicago: University of Illinois Press, 2009). 13 Sekula, “Interview with Allan Sekula by Edward Dimendberg,” in Facing the Music: Documenting Walt Disney Concert Hall and the Redevelopment of Downtown Los Angeles (Los Angeles: East of Borneo Books, 2015), 199. 14 Robin Robertson, The Long Take or A Way to Lose More Slowly, (London: Picador, 2018), 174. 15 Walter Benjamin, Understanding Brecht, trans. by Anna Bostock (London: Verso, 1998), 81. 17 Allan Sekula and Benjamin H.D. Buchloh, ‘Conversation between Allan Sekula and Benjamin H.D. Buchloh,’ in Performance Under Working Conditions, ed. Sabine Breitwieser (Vienna: Generali Foundation, 2003), 48. Posted in Essays and tagged Allan Sekula, Andrew Witt, capitalism, Immigrants, Jorge Ribalta, Kent MacKenzie, Labor, Los Angeles, Mack, Photography, Riots, Rodney King, San Pedro, Umberto Eco, Walter Benjamin.